Distribution Found in the Mexican states of Nayarit, Jalisco, Colima, and Michoaacan. Description:Planta epiphytica sut rupestris; caudex brevis, crassus, radicibus densis crassisque; petiolus 15-19 cm longus, 12-18 cm latas, lateribus complanatis, adaxile late sulcatus, abaxiale obtuse angulatus aut costatus; lamina oblanceolata aut oblanceolata-elliptica, subcoriacea, 52-108 cm longa, 15-43 cm lata, marginibus late undulatis, nervis primariis lateralibus ad marginem liberibus; inflorescentia effusa, foliis breviora; pedunculus 32-38 cm longus; spatha ovata aut ovata-elliptica, viridis, 13-16 cm longa; spadix viridis aut purpurata, 9-21 cm longa; baccae flavovirentes. 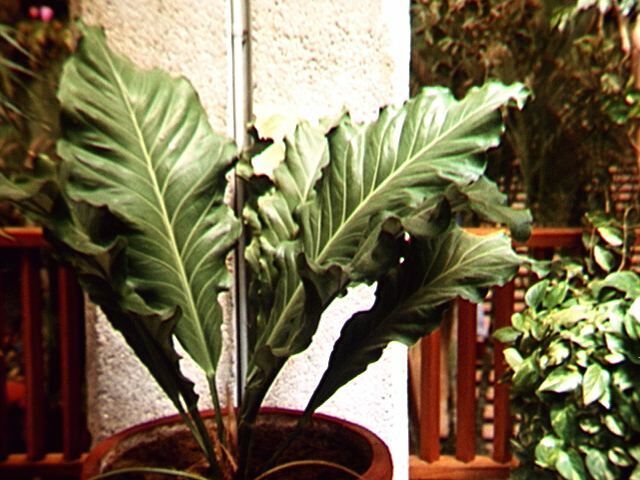 For a more detailed description of this species, see A Revision of Anthurium section Pachyneurium. Photo: Anthurium halmoorei in cultivation, photo courtesy of Don Martinson.